I last wrote about Purim, the Jewish holiday coming up this weekend, in 2010. So it’s time to revisit. This is one of the funnest of all fun holidays that we have on the Jewish calendar. The kids? They get to play dress-up (costumes are prevalent). The grown-ups? We are commanded to get drunk. Yes, COMMANDED. And to celebrate, friends and family send each other fun gifts. Is this holiday great or WHAT? So what is a hamantasch? The name of the cookie is a reference to the villian in the Purim story — Haman. Haman wanted to extinguish the Jews from the kingdom of Shushan. In the literature, Haman is often depicted wearing a three-cornered hat. So the triangle-shaped cookie is symbolic of our victory over the evil Haman (or something like that). 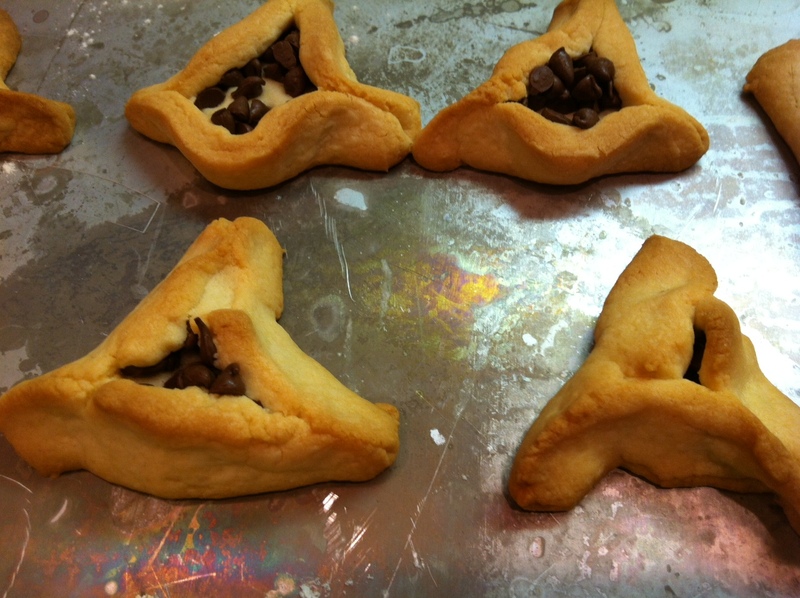 There are as many variations of hamantaschen as there are variations of Jews (and believe me, there’s a lot). But today I present to you the recipe that my mom passed down to me. I believe its origins are from a cookbook from a Jewish woman’s group she belonged to when I was a kid. The dough is so good on this recipe, it’s hard not to snack it. Kids will enjoy helping — young children will like turning circles into triangles (at least mine did). Preheat oven to 350 degrees. In mixer bowl, beat together sugar and butter until light and fluffy. Add egg, milk and vanilla and beat well. Combine flour and baking powder, stir into creamed mixture. (If dough is sticky, cover and refrigerate one hour. )Roll dough on floured surface about 1/8 inch thick. Cut with 3-inch round cookie cutter. ( A floured drinking glass will work). Top each round with 1/2 teaspoon fruit filling. Shape into triangles to look like Haman’s hat. Use your index finger and your thumb and gently pinch three corners. Leave center open, but make sure the filling is inside the dough. Place on ungreased cookie sheet for 16 minutes. Remove, cool and enjoy! Makes 3 dozen cookies. Laura Weisskopf Bleill is the Mom-in-Chief of chambanamoms.com. You can reach her at laura@chambanamoms(dot)com.